Ralph Fiennes (M. Gustave), Tony Revolori (Zero), F. Murray Abraham (Mr. Moustafa), Mathieu Amalric (Serge X. ), Adrien Brody (Dmitri), Willem Dafoe (Jopling), Jeff Goldblum (Deputy Kovacs), Harvey Keitel (Ludwig), Jude Law (Young Writer), Bill Murray (M. Ivan), Edward Norton (Henckels), Saoirse Ronan (Agatha), Jason Schwartzman (M. Jean), Léa Seydoux (Clotilde), Tilda Swinton (Madame D.), Tom Wilkinson (Author), Bob Balaban (M. Martin) and Owen Wilson (M. Chuck). Review: Directed by Wes Anderson , this is a hilarious, complex and quirky exercise into the creative mind of the director. Anderson’s eye for the absurd and small moments, fills the screen, and captivates. The story takes place in a pre-Nazi European country around 1932. Anderson uses the film aspect ratio of the time period, no widescreen here, as both a tip of the hat to the time and a way of making the unfolding events a more intimate visual experience. 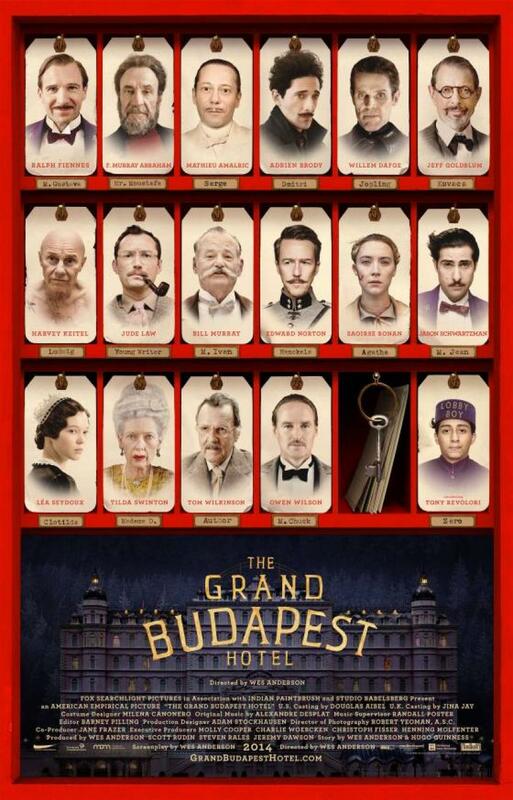 Gustave H. (Fiennes) is the legendary concierge of the Grand Budapest Hotel. He is a survivor and lives in a world of his own design. He sleeps with rich widows who inhabit the hotel, it is alluded to that he is bi-sexual and he certainly brings order to the chaotic world he has created. Zero Moustafa, (Revolori) a new foreign lobby boy, becomes Gustave H.’s trusted friend and protégé. Madame D., (Swinton) is a rich dowager who leaves her lover Gustave H. a priceless renaissance painting. When he hears of her death he arrives at her home for the reading of the will. The family members are evil, greedy and would kill each other to attain her wealth. Gustave with the aid Zero steals the painting and a hilarious and complex series of events ensues. Was the Dowager murdered for her money? Will Gustave rot in jail for taking the painting. Will Zero, who is in love with a pastry chef , Agatha, (Ronan) ever find happiness? Etc etc. The ensemble cast has been seen in other Anderson films, they include the always brilliant, Bill Murray, Bob Balaban, most recently seen in the film, Monuments Men, F. Murray Abraham as Mr. Mustafa, the teller of the tale, Jude Law, (a young writer), Tom Wilkonson, (author of the book about the hotel), Jeff Goldblum (Deputy Kovacs) , the executor of Madame D.’s estate, Willem Defoe (Joplin) the family hit man, Harvey Keitel (Ludwig) a hardened criminal Gustave meets in jail, and Bob Balaban (M. Martin) a fellow concierge and friend of Gustave. The story, albeit complex, is moving , clever and filled with visual delights. The film is loaded with unique Anderson visual moments, my favorite being, Keitel and company digging out of the jail with mini pickaxes and hammers provided by Agatha inside pastry she sent from her employer, Mendel’s Pastries. Anderson plants his camera dead center in all these moments, this way the frame is centered as little cameo moments play out, interspersed at various moments throughout. I certainly look forward to Anderson’s future mini epics of quirkiness. The Grand Budapest Hotel is well worth the trip. Synopsis: In this Golden Globe Nominated quirky comedy, set on an island off the coast of New England in the summer of 1965, Moonrise Kingdom tells the story of two twelve-year-olds who fall in love, make a secret pact, and run away together into the wilderness. As various authorities try to hunt them down, a violent storm is brewing off-shore — and the peaceful island community is turned upside down in more ways than anyone can handle. Bruce Willis plays the local sheriff. Edward Norton is a Khaki Scout troop leader. Bill Murray and Frances McDormand portray the young girl’s parents. The cast also includes Tilda Swinton, Jason Schwartzman, and Jared Gilman and Kara Hayward as the boy and girl. Review: Wes Anderson has dreamed up a ficticious Island that is inhabited by a quirkey bunch of offbeat characters. It is 1965, a twelve year old Khaki Scout Sam Shakusky, (Jared Gilman) leaves his scout camp and wonders off to find his true love Suzy Bishop, (Kara Hayward). The two of them go AWOL and this leaves the entire Island in an uproar. Captain Sharp, (Bruce Willis) and Scout Master Randy Ward, (Edward Norton) go on a search to find them. Everyone is worried about Suzy because Sam is an orphan so therefore he is mentaly disturbed. This is a given in the small minds of the community. Sam has trouble making friends as does Suzy and that is there bond. The color of the film is reminiscent of old 1960’s home movie color, this gives the film its’ character and other-worldy appearance. Narrator, (Bob Balaban) is the Island’s historian and cartoghrapher. He tells the story as a flashback, including an inside reference to Steven Spielberg’s Close Encounters. Balaban is standing in front of the police station as Suzy’s parents, Khaki Scouts and Master are arguing over where the children ran off to. Balaban interupts them by saying, “Excuse me, excuse me!” They all turn around, ‘I teach cartography and Sam was in my class, I know exactly where they went.” Shades of Close Encounters. Tilda Swinton plays “Social Sevices” and wants to take Sam to an institution, Harvey Keitel plays Khaki Scout Commander Pierce and his portrayal of self importance is hilarious. Bill Murry plays Walt Bishop, Suzy’s dad. Murry has a sadness in the way he approaches his characters, it his perhaps his weariness that his wife Laura, (Frances McDormand) is unhappy and has been having secret meetings with Captain Sharp, (Willis). He is understated and empathetic, his performance is the direct opposite of his manic characters he played on SNL. He has without a doubt matured as a actor. He was always brilliant this portrayal is no exception. Edward Norton as the scout Master is played with tongue firmly impanted in cheek. Norton, in short, was terrific in the role. The best cinema takes you away into flights of fancy, interesting story telling, compelling images and most of all human emotion. This film does all those things and makes you laugh along the way. I enjoyed its’ sense of humor and style. Thank you Wes Anderson for this delightful adventure with a nod to childhood. The film now nominated for the Golden Globe’s Best Motion Picture-Comedy or Musical, is available on Netflix, at the RedBox or for purchase on Amazon.